Alexa is the Executive Assistant to Managing Partner Jason Turkish at Nyman Turkish PC. She enjoys working at Nyman Turkish because of the interesting case work and the great team atmosphere. She hopes to further her knowledge of the field of law during her time at the firm. Alexa earned her Bachelor’s Degree in International Relations and French from James Madison College at Michigan State University with minors in Muslim Studies, Western European Studies, and a concentration in Economics. She is currently pursuing a Master’s in Business Administration at the University of Michigan Ross School of Business, and will continue on to law school. 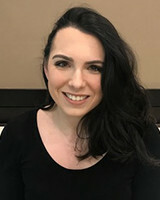 Prior to coming to Nyman Turkish, she worked as a financial analyst for a boutique consulting firm, as well as interning for the Michigan House of Representatives and the Consulate of Mexico. Outside of work, Alexa is a passionate musician, singing in the Choral Union at the University of Michigan, playing the piano, and learning the violin.